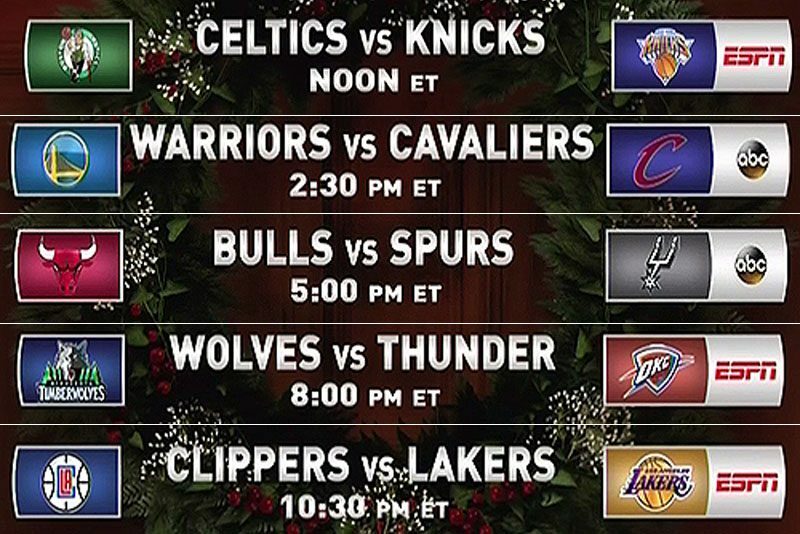 Sporting Alert – The following is the NBA schedule, game times and live TV and streaming information for all the games taking place on Christmas Day 2016. After getting the day off to spend time with their families on Christmas Eve, some of the biggest and brightest NBA stars will take the court on Sunday for five games to kick open the holiday festive. ESPN and ABC will provide the live broadcast throughout the day, while live online streaming is available on Watch ABC and WatchESPN. Highlighting the list of contests on Christmas Day is the repeat of last year’s NBA Finals between the Cleveland Cavaliers and the Golden State Warriors. Cavaliers v Warriors; James v Durant? The matchup is set for 2:30 pm ET and it is the second on the busy day of action. The game from Quicken Loans Arena will follow the opening tip-off between the Boston Celtics and the New York Knicks at Noon ET. Sunday’s game will be the first meeting between the Cavaliers and the Warriors since Cleveland miraculously won three straight games to turn around a 1-3 deficit and win its first NBA title last season. The Cavs got the better of Golden State in the NBA Finals seven-game series, but Warriors head coach Steve Kerr believes the addition of Kevin Durant has put his team in a better position. “We feel a little more comfortable going into this matchup with Kevin Durant on our team,” Kerr said. “It’s been a great rivalry the last couple of years. “LeBron is so good, so big, so strong, so smart. He’s a phenomenal player and it’s nice to be able to go back there with Kevin. “Obviously, they’ll guard each other quite a bit but we’ve got a lot of other guys we have to worry about, just as they have to worry about a lot of our guys. The Warriors (27-4) enter this game on a seven-game winning streak and have won 11 of the last 12 overall. Durant leads the team in scoring with 25.9 points per game and is shooting 54 percent from the floor. Stephen Curry is not too far away with 24.4 points per game and Klay Thompson is scoring 21.3 per outing. The hard working Draymond Green is averaging a near triple-double with 10.4 points, 8.9 rebounds and 7.4 assists, while as a team, Golden State is ranked No. 1 in points per game (117.5) and assists per game (31.3). “They’re already the toughest team to guard that I’ve played against, along with the Spurs, in my career,” James, who is scoring 25.3 points, dishing out 8.7 assists and pulling won 8.7 rebounds per contest told reporters. “So can you get more tougher to guard? 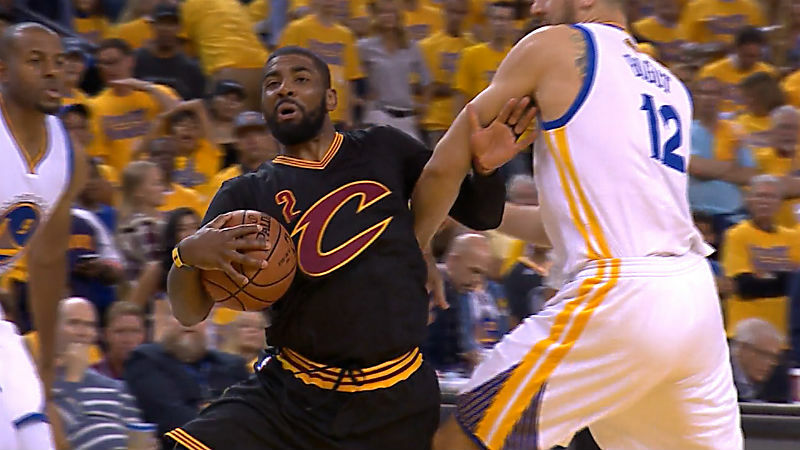 Cleveland (22-6) has won four straight and nine of the last 10 games overall. Star point guard Kyrie Irving (23.8 pts) and forward Kevin Love (21.9) are both scoring more than 20 points per game this season, with Love also contributing 10.8 rebounds. The Warriors won last year’s Christmas Day clash 89-83 and swept the regular season series. “Everyone gets so crazy with the penmanship and the coverage of a Christmas Day game, and then the next day you’ve got to play again and it’s over,” James said. Cleveland is 15-2 at home this term, while Golden State is 15-2 on the road. In the late tip-off at STAPLES Center, the Clippers and Lakers will do battle, live on ESPN at 10:30 pm ET. The two teams are on the opposite side of the Western Conference – with the Clippers (22-9) sitting third in the standings and the Lakers (11-22) fourth from the bottom. Doc Rivers’ team is coming off a disappointing 90-88 against the Dallas Mavericks on Friday, while Luke Walton young side has lost four straight. In fact, the Lakers have dropped 12 of the last 13 games and head into Sunday’s Christmas Day contest as a six-point underdog, according to the bookmakers. “We should’ve won some of those [games we lost],” Walton said after the 109-90 loss to Orlando. The Clippers are without forward Blake Griffin for up to six weeks after he underwent knee surgery, while Chris Paul is dealing with a left hamstring injury. Paul missed the defeat against the Mavericks but the injury isn’t too severe. The Lakers are led in scoring by veteran reserve Lou Williams, who is averaging 18.9 points per game. D’Angelo Russell is scoring 15.1 points per contest this season, while Jordan Clarkson is scoring 14.6 and Nick Young is putting out 14.3 per game. Meanwhile, If Paul is unable to play again on Sunday, the Clippers will be without their two leading scorers for two successive games, so the likes of J.J. Redick, Jamal Crawford, Austin Rivers and DeAndre Jordan will have to do the bulk of the scoring. Sunday’s game is the first meeting between the two Los Angeles clubs this season. The Lakers are the home team. In other Christmas Day NBA fixtures, the New York Knicks will host the Boston Celtics at Madison Square Garden, Russell Westbrook and the Oklahoma City Thunder entertain the Minnesota Timberwolves at Chesapeake Energy Arena, while the San Antonio Spurs and the Chicago Bulls will do battle. Besides Durant, James and Curry, NBA neutrals will also be interested in seeing players such as Westbrook, who is averaging a triple-double with 31.8 points, 10.8 assists and 10.5 rebounds, as well as Spurs’ Kawhi Leonard, Knicks Carmelo Anthony and Boston’s Isaiah Thomas in action on Christmas Day.